This instrument has light sensors on its perimeter, the darker spots. 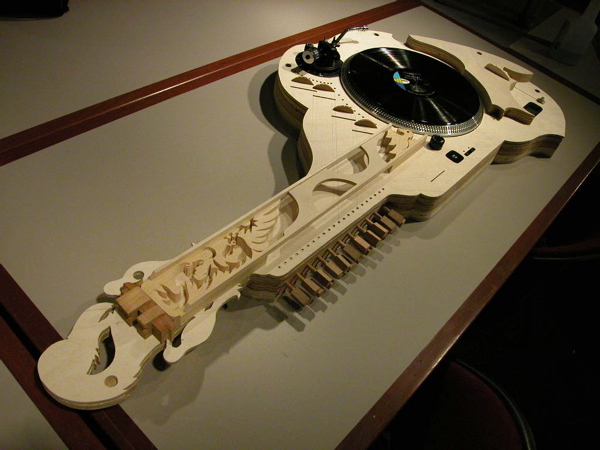 The player may gesture over the instrument and when their shadow falls on the sensors it triggers internal motors which strum groups of strings creating a bed of sound over which to play the 3 main strings. The turntable can also be controlled by light and can be moved backwards and forwards with a wave of the hand. Below is the PhonoSitar I eventually built as an exhibit for the Singapore Science Centre.